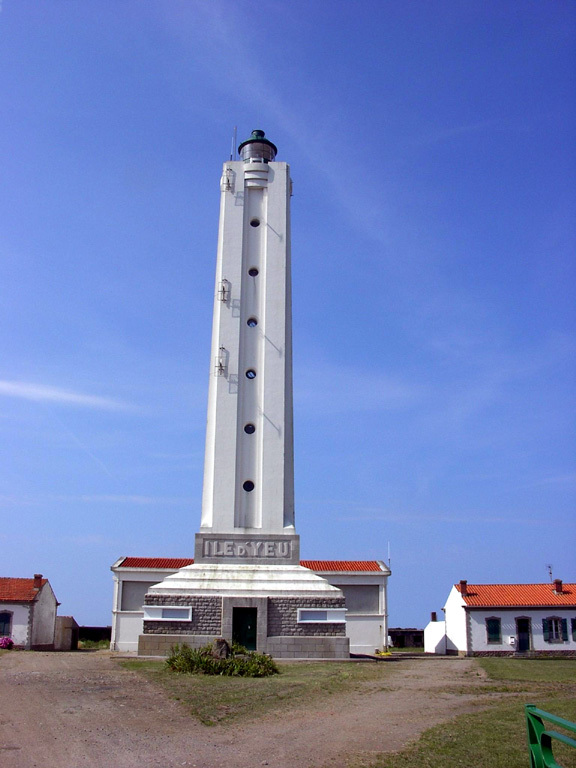 This page includes lighthouses of the west coast of France in the département of Vendée, which includes the coastline of the historic province of Poitou. This coast faces the Bay of Biscay, the arm of the Atlantic between the peninsulas of Brittany and Spain. Unlike the rocky and deeply-indented coast to the north, this is a relatively low, sandy coast. The Île de Noirmoutier and the Île d'Yeu are included in the département. Information on the major historic lighthouses. Photos posted by Alexander Trabas; many of the photos for the Vendée coast were contributed by Arno Siering or Christophe Boxus. Navigational chart information for Vendée. 1953 (station established 1831). Active; focal plane 29 m (95 ft); flash every 5 s, white, red, or green depending on direction. 16 m (52 ft) octagonal concrete Art Deco tower with lantern and gallery. Tower is white concrete; lantern painted black. Werning's photo is at right, Trabas has Siering's excellent closeup, Wikimedia has a photo, Guyomard and Carceller have photos, and Google has a street view and a satellite view. Huelse has a historic postcard view of the first lighthouse, a masonry tower attached to a keeper's house; it was destroyed by German troops in July 1944. 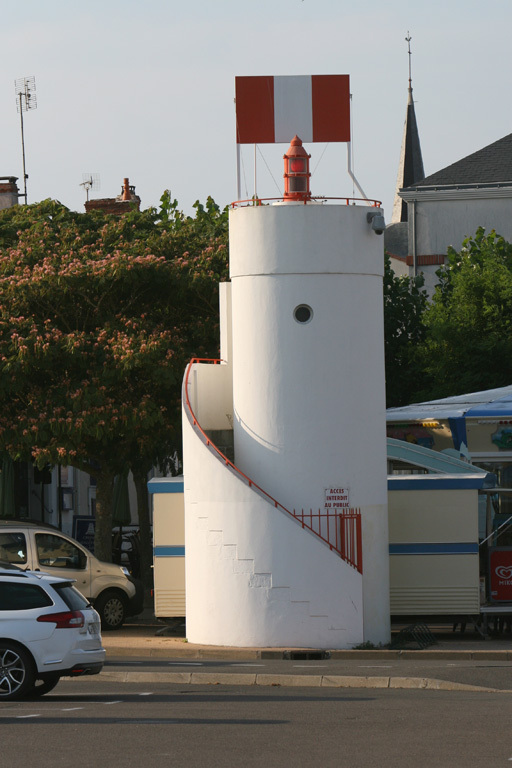 This replacement is one of four Art Deco towers in Vendée (all different) designed by the architect Maurice Durand; the others are Île d'Yeu, Pointe de Grosse Terre, and L'Armendèche. 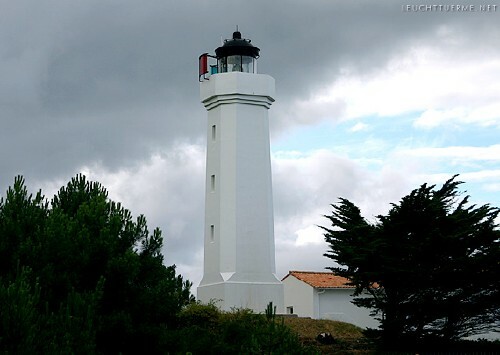 The lighthouse guards the entrance to the Pertuis Breton, the sound sheltered by the Île de Ré. Located on a prominent point of land off the Rue du Phare at the Place de la Baleine on the west side of La-Tranche-sur-Mer. Site open, tower closed. ARLHS FRA-311; Admiralty D1214; NGA 1240. Note: Les Sables-d'Olonne is a seaside resort town with a population of about 45,000. Date unknown. Active; focal plane 9 m (30 ft); quick-flashing green light. 5 m (16 ft) 1-story octagonal equipment room with a short post light centered on the roof. Lighthouse is white with a red tile roof. Trabas has a closeup photo, Nicolas L'Hopital has a street view, and Google has a satellite view. The rear light is on a mast. Located on the quay at Port-Bourgenay, the small boat harbor of Bourgenay-Querry-Pigeon, about 10 km (6 mi) east southeast of Sables-d'Olonne. Site open, tower closed. ARLHS FRA-548; Admiralty D1211; NGA 1222. 1874. Inactive since sometime after 1982. Approx. 12 m (39 ft) 3-story square cylindrical masonry tower with balcony at the third floor window. The light was displayed through that window. Lighthouse painted white with buff trim; balcony railing is black. Google has a street view and a satellite view. The active light is mounted on a nearby post. Huelse has a historic postcard view. Vessels arriving at Sables-d'Olonne follow this range, and then make a right-angle turn to the left (port) onto the Arundel range (see below). 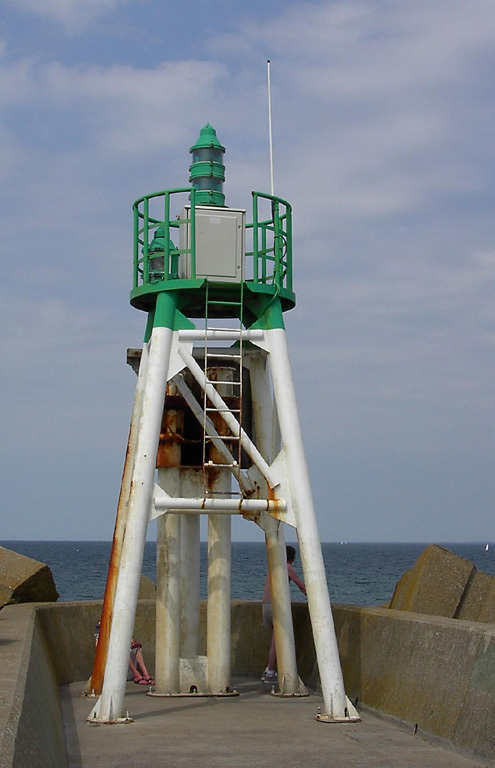 The lighthouse was deactivated after shoaling offshore made it necessary to adjust the angle of approach. 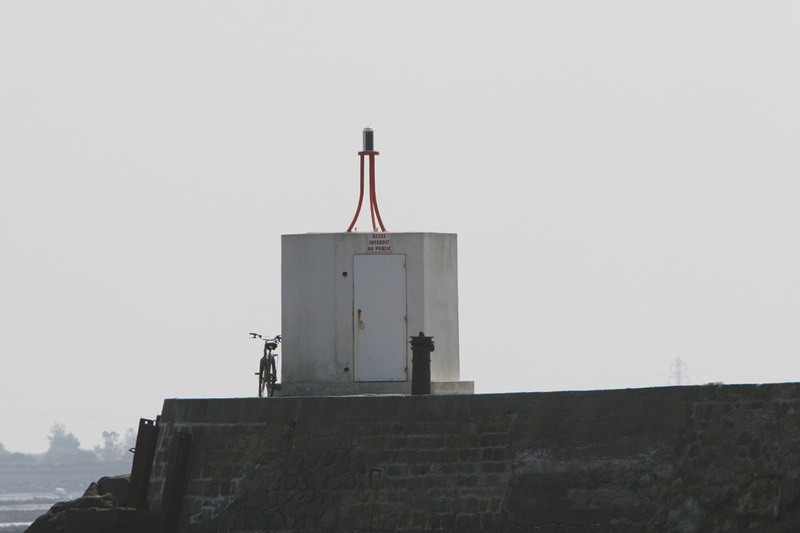 The current light is on a 12 m (39 ft) metal pole about 50 m (60 yd) south of the lighthouse. 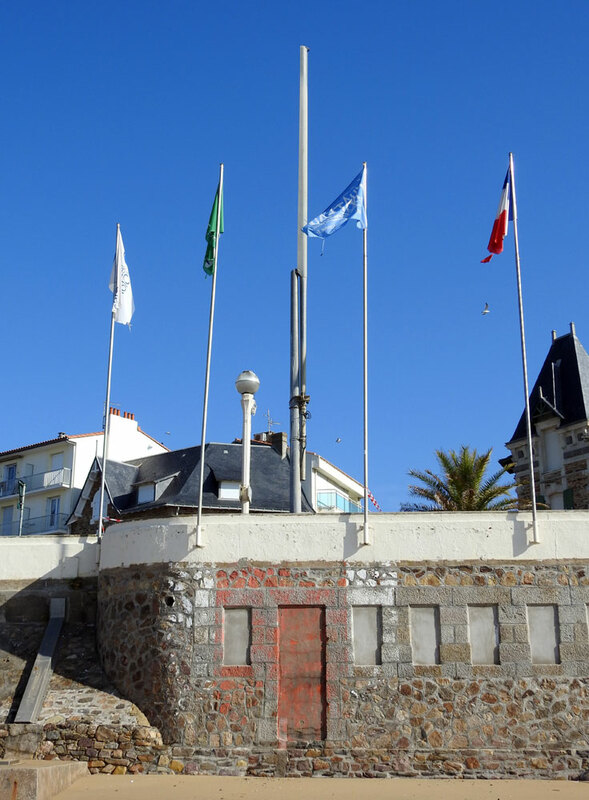 Located on the quay at the lower end of the Rue des Deux Phares in Les Sables-d'Olonne. Site open, tower closed. Admiralty D1207; NGA 1196. 1874. Active; focal plane 33 m (108 ft); white light, 2 s on, 2 s off. 20 m (66 ft) square cylindrical masonry tower with gallery and a small modern lantern, rising from the front of a 1-1/2 story keeper's house. There is also a balcony at the window of the sixth floor of the tower. Entire structure painted white. Marc Lagneau's photo is at right, Trabas has a photo, Huelse has a historic postcard view, and Google has a street view and a satellite view. The keeper's house was the local office of the Bureau des Phares et Balises, according to Guyomard and Carceller, but this is not be true any more: the building is boarded up in Marc Lagneau's July 2009 photo at right. The office may well have been moved to the Tour d'Arundel. The light was originally displayed through the window having the balcony; the lantern, raising the height of the light, was added in 1965. Note: la potence means "the gallows." 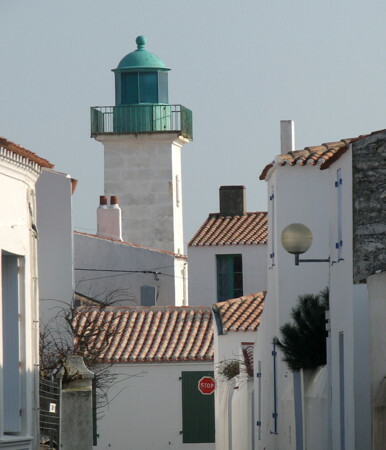 The Rue des Deux Phares (Street of the Two Lighthouses) joins this lighthouse to the former front light, L'Estacade. Site open, tower closed. ARLHS FRA-442; Admiralty D1207.1; NGA 1200. 1835. Active; focal plane 11 m (36 ft); quick-flashing green light. 9 m (30 ft) round cylindrical masonry tower with lantern and gallery. Tower painted white, lantern and gallery green. Trabas has a closeup photo, a distant view along the jetty is available, Huelse has a historic postcard view, Pierre Cal has a closeup street view, and Google has a satellite view. This lighthouse may be endangered. Guyomard and Carceller have a small photo showing the tower with its troubling but long-standing lean. Engineers say the tower is stable and will not fall. The lighthouse was rebuilt in 1951 after being heavily damaged by German bombers in 1944. 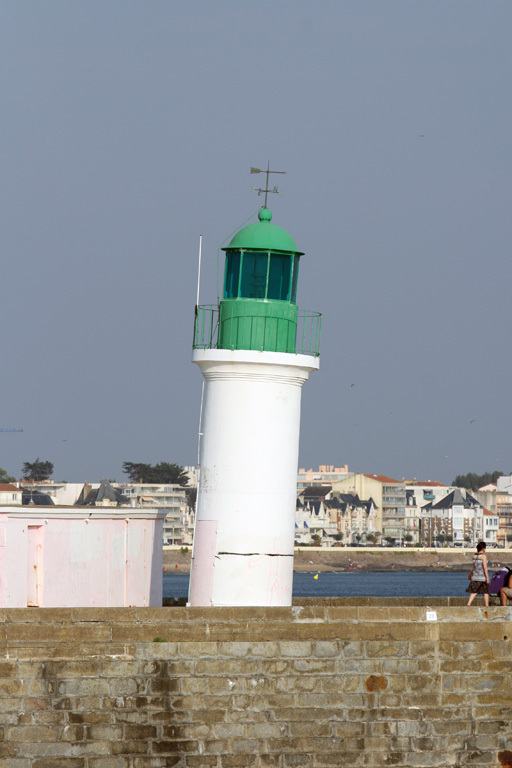 Located at the end of the jetty on the east side of the harbor entrance at Les Sables-d'Olonne. Accessible by walking the jetty. Site open, tower closed. ARLHS FRA-466; Admiralty D1204; NGA 1216. Date unknown. Active; focal plane 9 m (30 ft); red light, 2 s on, 2 s off, synchronized with the front range. 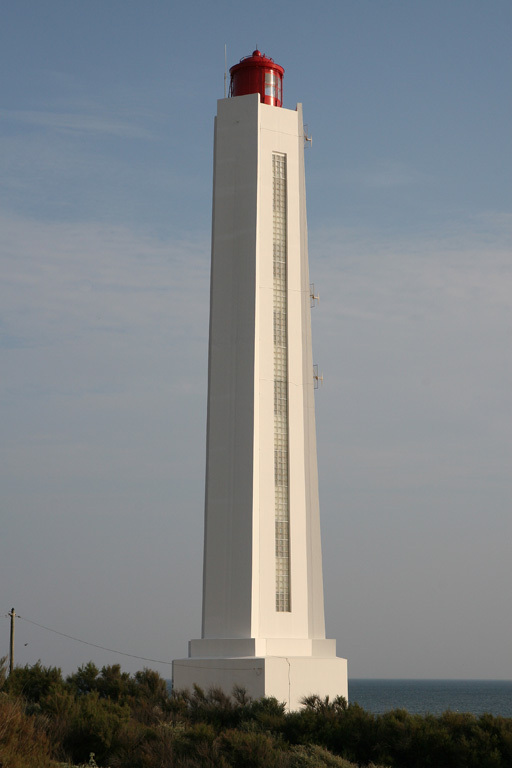 9 m (30 ft) round cylindrical concrete tower, painted white; a narrow stairway winds around the tower. Trabas has a photo, and Google has a street view and a satellite view. The front light is on a small square tower. Located at the Place d'Ormeau, a short distance north of the Tour d'Arundel (next entry). Site open, tower closed. Admiralty D1210.1; NGA 1208. 1806. Active; focal plane 33 m (108 ft); quick-flashing white light. 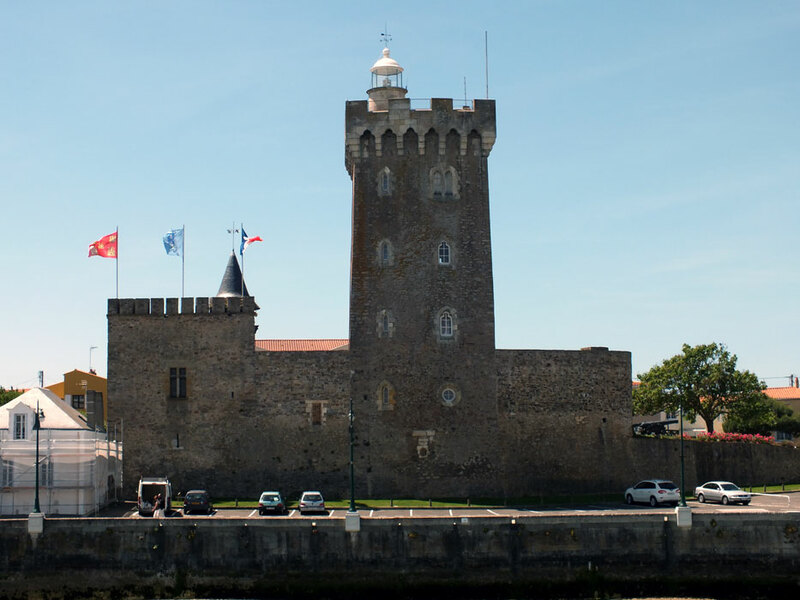 27 m (89 ft) square medieval castellated stone tower with a cylindrical light tower, lantern and gallery on the top. Béatrice Louette's photo is at right, Trabas has a similar photo by Siering, Werning also has a good photo, Huelse has a historic postcard view, and Google has a street view and a satellite view. 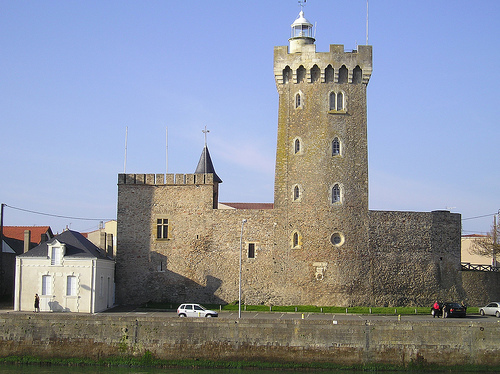 The Comte d'Olonne was granted royal permission in 1593 to levy fees for displaying a fire from the top of this historic tower of the Château d'Arundel, but it appears that the tower was rarely used as a lighthouse before the 1700s. In 1794 the tower was purchased by the national government and in 1806 a lantern was installed. The tower was restored, with a new light tower added, in 1855. 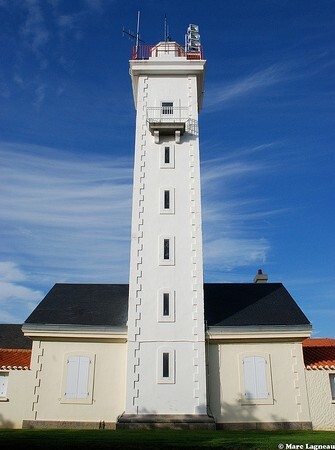 The tower formerly housed the control center for lighthouses throughout the Vendée, but more recently it has been converted to a maritime museum. It serves as the rear light of a range with the Jetée des Sables light, guiding ships northwestward to the harbor entrance. Located on the Place Maraud la Chaume on the west side of the main channel into the harbor of Les Sables-d'Olonne. Site open, museum and tower open daily. Site manager: Organisme de Culture d'Étude and d'Action Maritime (La Tour d'Arundal). ARLHS FRA-174; Admiralty D1204.1; NGA 1220. 1911. Active; focal plane 16 m (52 ft); quick-flashing red light. 14 m (46 ft) round masonry tower with lantern and gallery. Tower painted white, lantern and gallery red. Trabas has a closeup, Werning also has a good photo, Gwennolé Becdelièvre has a dramatic 2009 photo, Huelse has a postcard view, Jean-Michel Nguyen has a distant view of both jetty lights, and Google has a street view and satellite view. The Jetée de Saint-Nicolas is the breakwater mole sheltering the west side of the harbor entrance. Located at the end of the mole. The mole is walkable but the narrow section at the end is closed. Site and tower closed. ARLHS FRA-498; Admiralty D1200; NGA 1212. 1968. Active; focal plane 42 m (138 ft); three white flashes in a 2+1 pattern every 15 s. 39 m (128 ft) Art Deco hexagonal concrete tower with lantern and gallery. Tower is white concrete, lantern painted red. A photo is at right, Stephane Lambert has a 2016 photo, Trabas has an excellent photo, Werning also has a good photo, and Google has a street view and a satellite view. 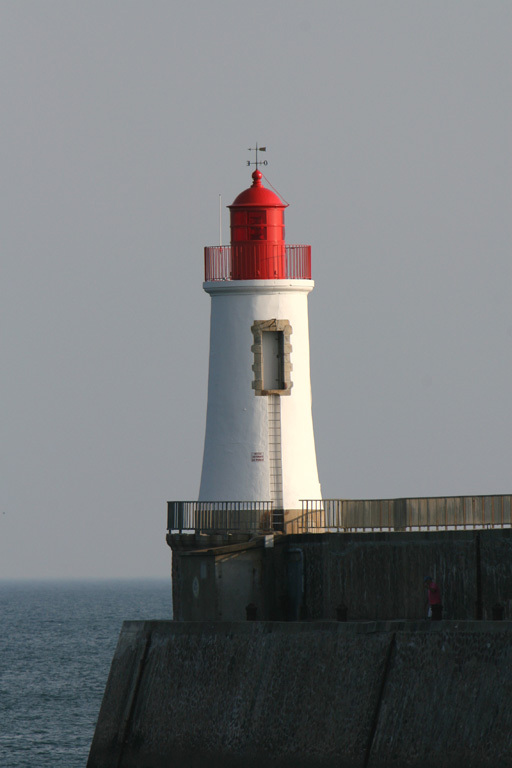 The lighthouse, designed by the Sables-d'Olonne architect Maurice Durand, was built as a landfall light because development along the shoreline had obscured mariners' view of the harbor entrance lights. 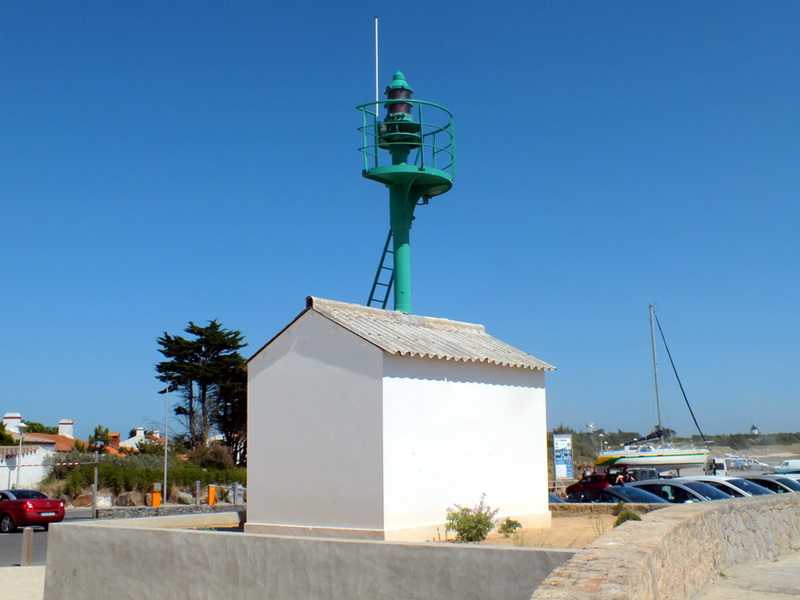 Located just behind the beach, off the Route Bleue, the shoreline boulevard on the west side of Les Sables-d'Olonne. Site open, tower closed. ARLHS FRA-173; Admiralty D1196; NGA 1180. 1861 (Charles Marin). Active; focal plane 25 m (82 ft); two red flashes every 10 s. 29 m (95 ft) round granite tower with gallery. The original lantern was removed in the 1970s and replaced with a modern steel structure. Tower is unpainted gray stone; lantern structure painted red. Isabelle Romaniec has a 2009 closeup, Wikimedia also has a closeup, Trabas has a photo, Werning has a photo, and François Raimbaud has a nice sunset view. Huelse has a historic postcard view showing the original lantern. The lighthouse was restored in 1989. Located on a rocky reef called La Grande Barge, about 2.5 km (1.5 mi) west of the beach on the west side of Les Sables d'Olonne. Accessible only by boat; there are good if somewhat distant views from the beach. Site and tower closed. ARLHS FRA-010; Admiralty D1198; NGA 1184. 1880. Active; focal plane 7 m (23 ft); quick-flashing white light, intensified on the range line and synchronized with the rear light. 7 m (23 ft) square stone tower with window and balcony. Originally the light was displayed though the window, but now it is mounted on the balcony railing. Tower painted white, with the upper half of the front face painted red. Trabas has a closeup, Huelse has a historic postcard view, and Google has a street view and a satellite view. Located on the Quai de la République, the waterfront of Saint-Gilles-Croix-de-Vie. Site open, tower closed. ARLHS FRA-480; Admiralty D1190; NGA 1160. 1880. Active; focal plane 28 m (92 ft); quick-flashing white light, intensified on the range line and synchronized with the front light. 24 m (79 ft) masonry tower with lantern and gallery. Tower painted white; lantern, gallery and top of tower painted red. At the watch room level is a window with balcony, matching the style of the front light. Originally there was no lantern and the light was displayed though the window. The lantern and gallery were added in 1890. Trabas has a fine closeup photo, Guyomard and Carceller have additional photos, Huelse has a historic postcard view, and Google has a street view and a satellite view. However, photos of this conspicuous and accessible lighthouse are surprisingly rare. 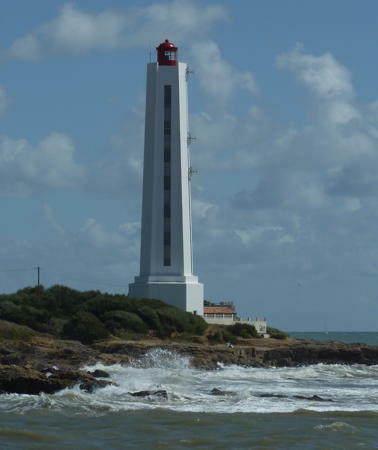 Located on the Rue Henri Raimondeau at the Vanelle du Grand Phare, in the center of Saint-Gilles-Croix-de-Vie, 260 m (285 yd) northeast of the front light. ARLHS FRA-481; Admiralty D1190.1; NGA 1164. 1852. Inactive since 1880 (a decorative white light has been displayed since 2000). 9 m (30 ft) round cylindrical stone tower with lantern and gallery. Tower is unpainted gray stone; lantern painted green. The tower is floodlit at night. A photo is at right, Delphine Moquet Wable has a photo, Hazel Tsoi has a view, and Google has a street view and a satellite view. 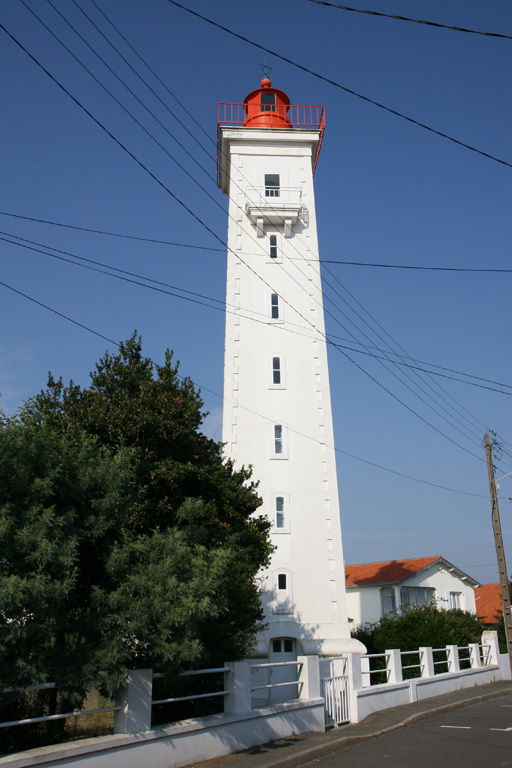 The original lighthouse at Saint-Gilles, this tower was named for Joséphine, the wife of Emperor Napoleon III; it was replaced by the entrance range lights (previous entries) in 1880. The lantern was removed but the capped tower remained. In 2000 the city restored the old tower and added a replica lantern. J.W. Vaur described the lantern as selon les plans d'origine (historically accurate) although it seems to have a more modern appearance. In September 2005 the 1-story keeper's house opened as a literary museum devoted to French maritime authors. The intention was to open the tower for climbing but this has not occurred. 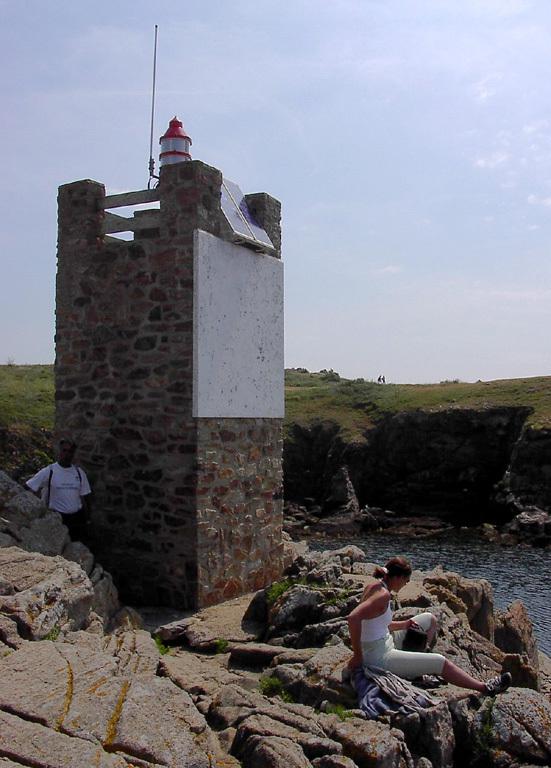 Located on the jetty not far from the Boisvinet light; the keeper's house is onshore nearby at 9 Rue Jean Cristau. Site open, museum open daily, tower status uncertain. Site manager: Maison des Écrivains de la Mer. ARLHS FRA-636. 1967 (?). Active; focal plane 25 m (82 ft); four flashes, white or red depending on direction, every 12 s. 17 m (56 ft) round white concrete tower with gallery but no lantern. Trabas has a photo, Florent Moritz has a 2008 photo, and Google has a street view and a satellite view. J.W. Vaur has 1972 as the date of this lighthouse. The lighthouse was built as a landfall light because development along the shoreline had obscured mariners' view of the harbor entrance lights. Located on a point of land just off the D6 coastal highway on the west side of Saint-Gilles-Croix-de-Vie. Site open, tower closed. ARLHS FRA-310; Admiralty D1189.6; NGA 1168. Note: The Île d'Yeu lies in the open Atlantic 18 km (11 mi) southwest of Notre-Dame-des-Monts. The island is 9.5 km (6 mi) long by about 4 km (2.5 mi) wide and is a popular tourist destination. The island has a permanent population of about 5000 and is accessible by air or by ferries from La-Barre-des-Monts or from Saint-Gilles-Croix-de-Vie. 1950 (station established 1862). Active; focal plane 25 m (82 ft); three red flashes in a 2+1 pattern every 15 s. 19 m (62 ft) octagonal concrete tower with lantern and gallery, attached to a 1-story keeper's house. Tower and gallery are white concrete, lantern painted red. A photo is at right, Trabas has a good closeup by Boxus, Sébastien Berger has another nice closeup, William Barré has a street view, and Google has a satellite view. Huelse has a historic postcard view of the original lighthouse, a square stone tower attached to a 1-1/2 story keeper's house, which was destroyed by German troops in August 1944. 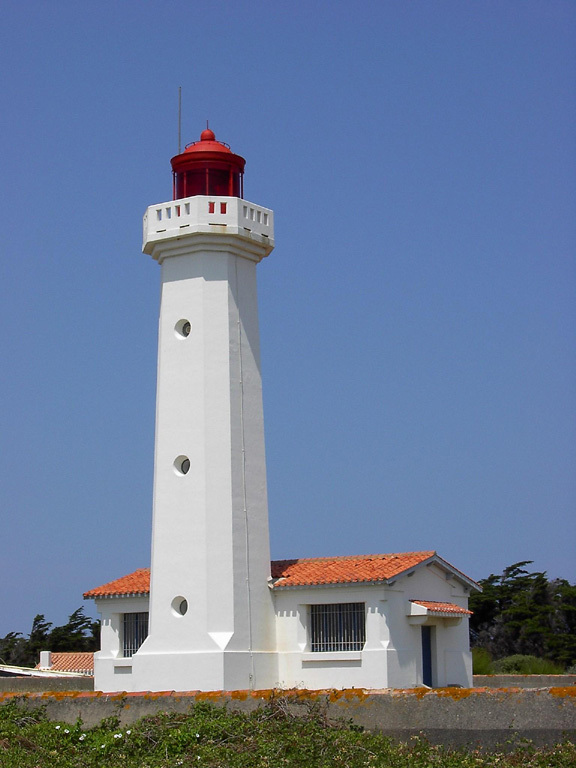 Like the Grand Phare the replacement lighthouse was designed by the architect Maurice Durand. Located at the southeastern point of the island. Site open, tower closed. ARLHS FRA-249; Admiralty D1186; NGA 1148. Date unknown. 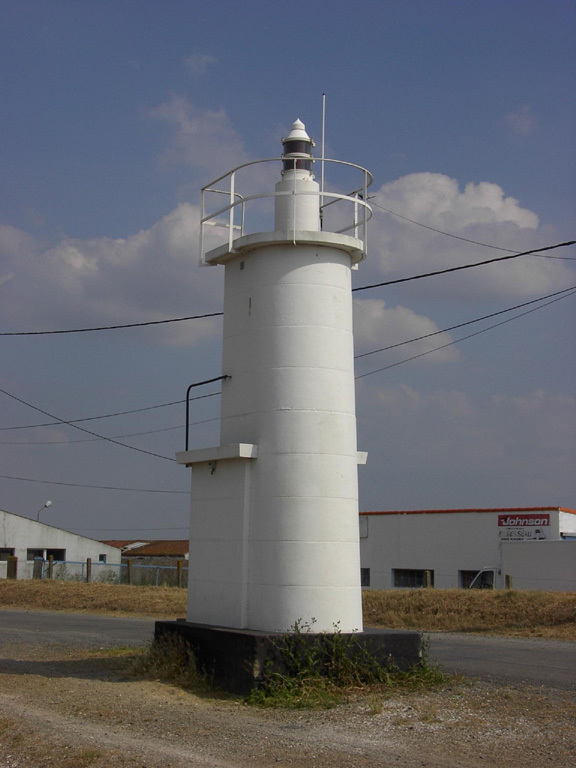 Active; focal plane 9 m (30 ft); white, red, or green light depending on direction, occulting once every 4 s. 6 m (20 ft) square cylindrical rubblestone tower with a modern light on the top. Trabas has a closeup by Boxus, Julien Marionnaud has a closeup street view, and the small tower casts a long shadow in Google's satellite view. Located at the tiny small boat harbor of La Meule, on the south coast of the island. Site open, tower closed. Admiralty D1188; NGA 1152. 1950 (station established 1830). Active; focal plane 56 m (184 ft); white flash every 5 s. 38 m (125 ft) round Art Deco concrete tower with lantern and gallery, rising from a square 1-story stone base. Tower is white concrete; lantern painted black; base is gray stone. Large light station with several 1-story keeper's houses and other buildings. A photo appears at the top of this page, Trabas has a closeup by Boxus, a 2016 photo is available, Wikimedia has photos, and Google has a satellite view. Huelse has posted a postcard view of the original lighthouse, a handsome 33 m (108 ft) masonry tower. That lighthouse was destroyed by German troops on 25 August 1944. 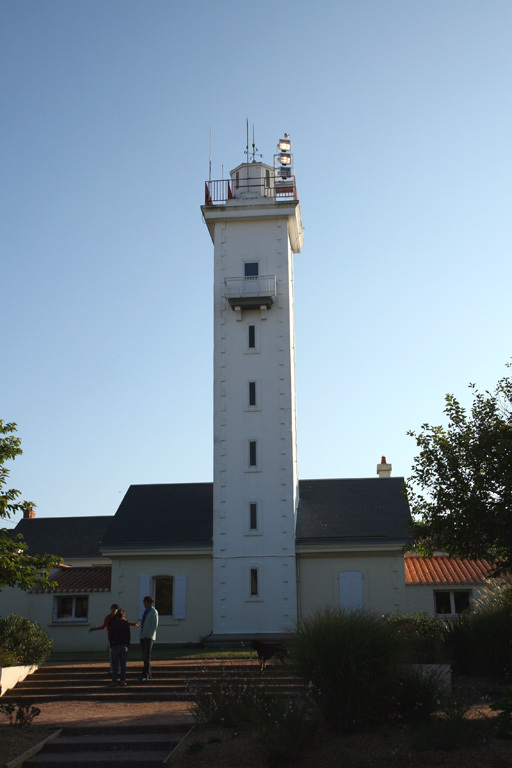 After the war, a temporary light was established until the present lighthouse, designed by the architect Maurice Durand, was completed. Petite foule ("little crowd") is the name of a nearby cluster of megalithic monuments. Located on the heights above the island's airport, about 1.6 km (1 mi) east of the Pointe du But and 3 km (2 mi) southwest of Port-Joinville. Site open, tower open Wednesday, Friday and Saturday April through September and daily in July and August. ARLHS FRA-391; Admiralty D1176; NGA 1128. 1935. Active; focal plane 16 m (52 ft); nine quick flashes, white or green depending on direction, every 15 s. 19 m (62 ft) round solid stone tower; light displayed from a short mast at the top. Tower painted with blue and yellow horizontal bands, although these appear black and white at a distanced. A 2006 photo is available, and Google has a satellite view. Located on a rocky ledge about 800 m (1/2 mi) off the Pointe du But, the northwestern point of the island; a 1-story fog signal building, now inactive, is located at the tip of the point. Accessible only by boat. Site and tower closed (fog signal site open). ARLHS FRA-630; Admiralty D1178; NGA 1132. 1880. Inactive. Approx. 7 m (23 ft) octagonal cast iron tower with lantern, attached to a small equipment room. Lighthouse painted white, lantern green. Wikimedia has a closeup photo by Remi Jouan, an excellent 2008 photo is available, and Google has a satellite view. 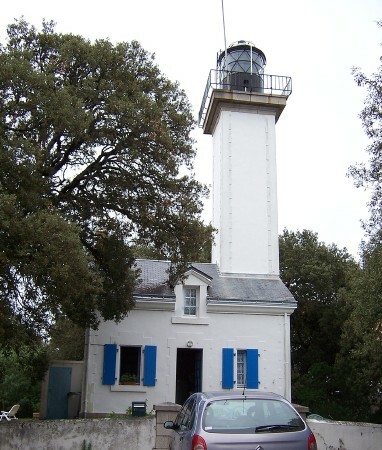 Renaud Derbois has a 2015 street view showing the lighthouse has been refurbished and repainted. 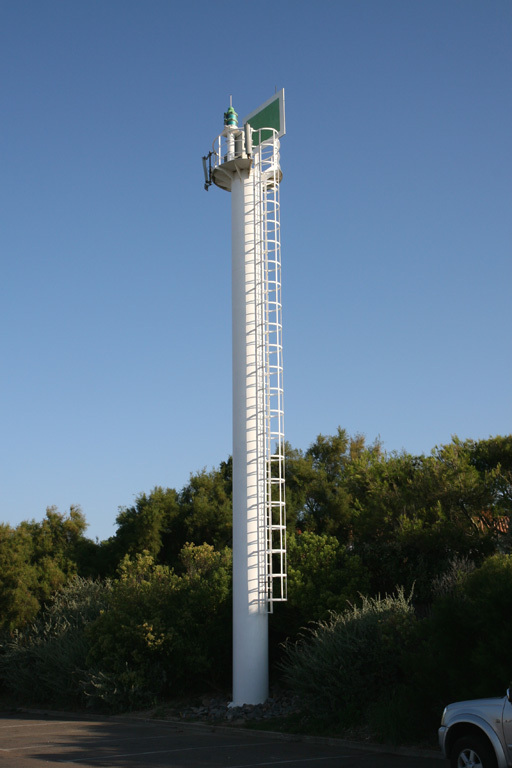 The jetty has been extended, and the light (focal plane 6 m (20 ft); white or green light depending on direction, occulting three times every 12 s) was moved to a short skeletal tower at the end of the extension. Trabas has a photo of the new light by Boxus and Derbois has a street view. 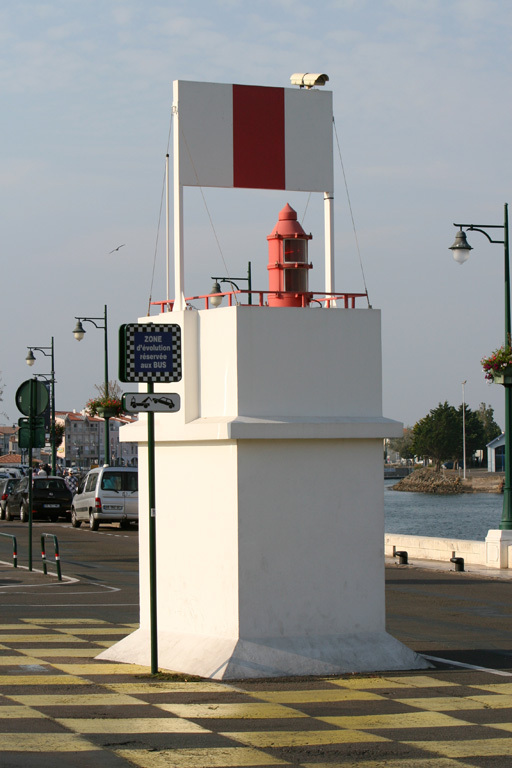 Located at the former end of the northeast jetty of Port-Joinville. Site open, tower closed. ARLHS FRA-319. Active light: Admiralty D1180; NGA 1136. 1837 (station established 1832). Active; focal plane 7 m (23 ft); green light, 2 s on, 2 s off. 5 m (16 ft) round masonry tower with lantern and gallery. Tower painted white, lantern green. 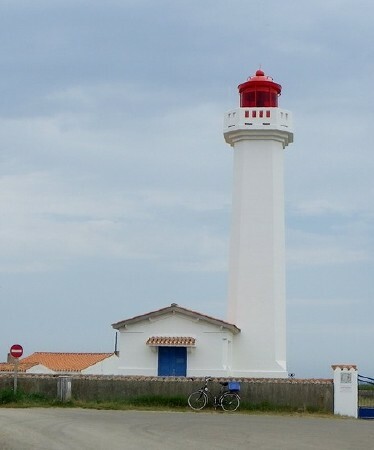 This lighthouse and the rear light are seen at the right of Laurent Guerin's photo, Trabas has a fine photo by Boxus, Guyomard and Carceller also have a good photo, Klaus Huelse has a historic postcard view, Florian Peroud has a distant street view, and Google has a satellite view. The name Quai du Canada recalls that many of the Acadian settlers of Canada's maritime provinces came from this area. Originally this was the front light of the harbor entrance range. Located at the head of the quay on the west side of the inner harbor. Site open, tower closed. ARLHS FRA-320; Admiralty D1184; NGA 1144. 1845 (station established 1832). Inactive. 12 m (39 ft) square cylindrical masonry tower with lantern and gallery, rising from one end of a 1-1/2 story stone keeper's house. Stéphane Batigne's photo is at right, Guyomard and Carceller also have good photos, Wikimedia has several photos, Huelse has a historic postcard view, and Google has a satellite view. Tower painted white, lantern and gallery green. Originally this was the rear light of the harbor entrance range. Its present use is not known. Located on the Rue des Mariés about 265 m (290 yd) south of the Quai du Canada light. Site open, tower closed. ARLHS FRA-628. Date unknown. Active; focal plane 6 m (20 ft); four red flashes every 15 s. 12 m (39 ft) round solid stone tower with gallery, painted bright red. 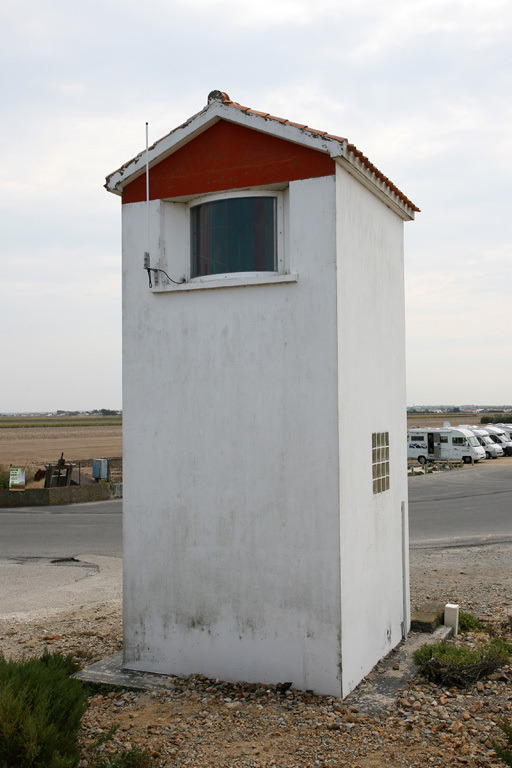 Trabas has a photo, Google has a distant street view from the Île de Noirmoutier bridge, and Google has a satellite view. The Goulet de Fromentine is the strait separating the Île de Noirmoutier from the mainland. 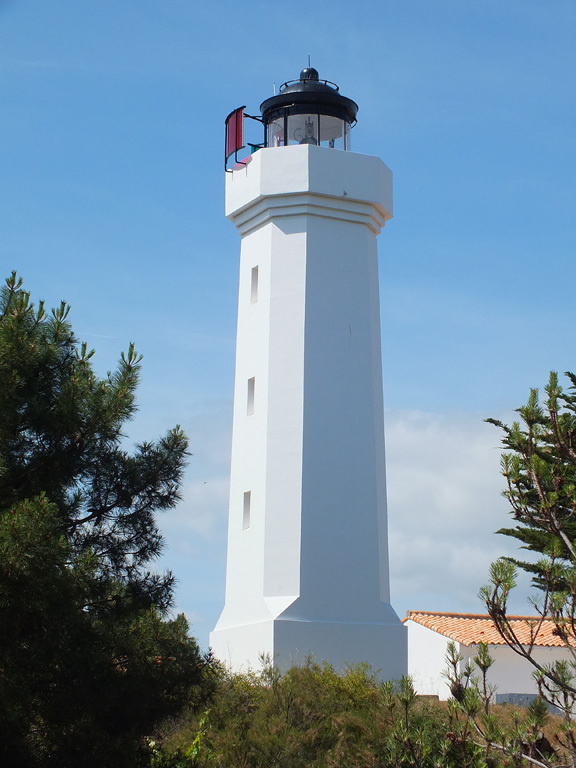 This well-known beacon is located on the north side of the entrance to the Goulet from the Atlantic, just off the south point of the Île de Noirmoutier. 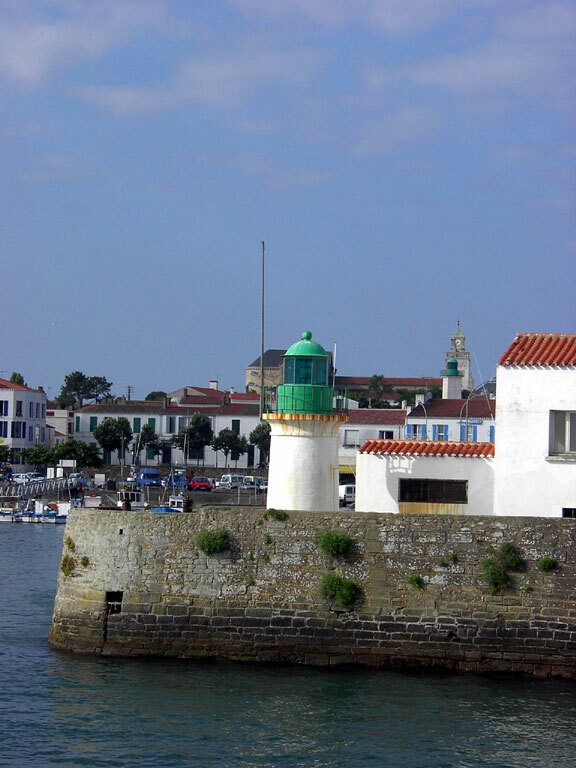 Accessible only by boat; there are excellent views from the ferry to the Île d'Yeu. Site and tower closed. Admiralty D1170; NGA 1112. Date unknown. Inactive as a lighted aid but maintained as a daybeacon. Approx. 12 m (39 ft) round solid stone tower with gallery, painted white. 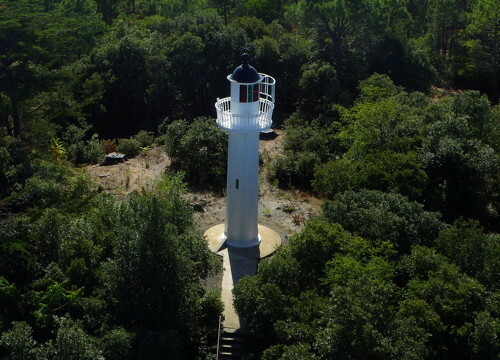 A street view from the top of the lighthouse is available, Google has a distant street view from the Île de Noirmoutier bridge, and Google has a satellite view. Located off the beach on the south side of the entrance to the Goulet from the Atlantic. Accessible at low tide, and there should be good views also from the ferry to the Île d'Yeu. Site open, tower closed. 1915 (station established 1881). 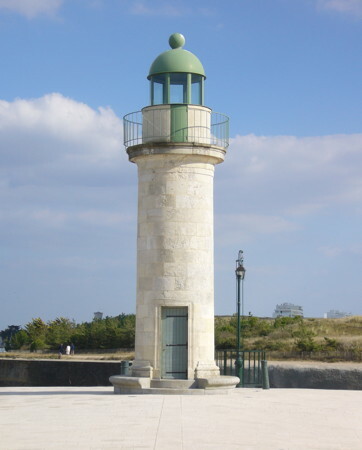 Active; focal plane 21 m (69 ft); white, red, or green light, depending on direction, occulting twice every 6 s. 10 m (33 ft) round cylindrical cast iron tourelle with lantern and gallery. The red and green colors are provided by filters attached to the gallery rail. 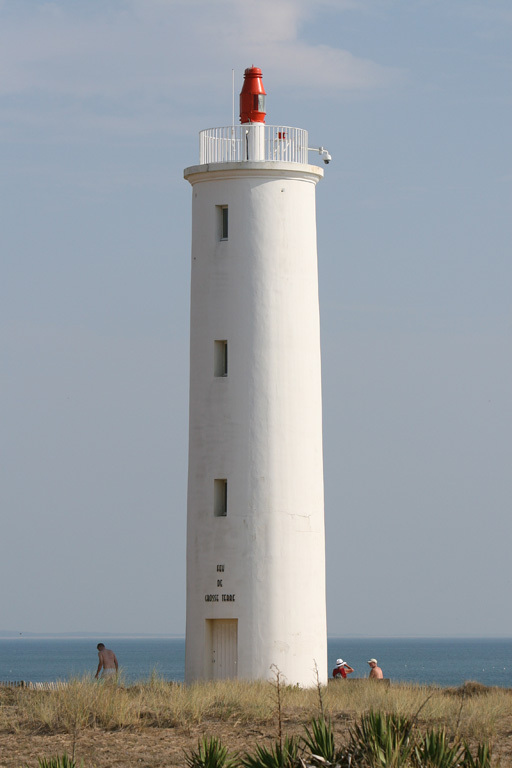 Lighthouse painted white, lantern dome black. A photo taken from a kite is at right, Trabas has a closeup photo, another photo is available, Huelse has a historic postcard view, and Google has a satellite view. This lighthouse has been restored recently; Guyomard and Carceller's photos show it in much better condition than Fichou's photo. "Les Monts" (mountains) is a reference to prominent sand dunes south of the Goulet de Fromentine entrance. Located in a park at the end of the Avenue du Phare in Fromentine, on the mainland just inside the Goulet. Site open, tower closed. ARLHS FRA-374; Admiralty D1172; NGA 1120. Note: The Île de Noirmoutier, lying just off the coast of the mainland, shelters the west side of the Baie de Bourgneuf. The island is 19 km (12 mi) long and up to 6 km (3.7 mi) wide. Accessible by bridge, it is a popular resort destination. The island has a permanent population of about 10,000. 1925. Active; focal plane 10 m (33 ft); white, red, or green light, depending on direction, occulting four times every 12 s. 7 m (23 ft) post with a small gallery, rising from an equipment shed. Gallery and upper half of the post painted green, the rest of the lighthouse white. Trabas has Siering's closeup photo and Google has a street view and a satellite view. 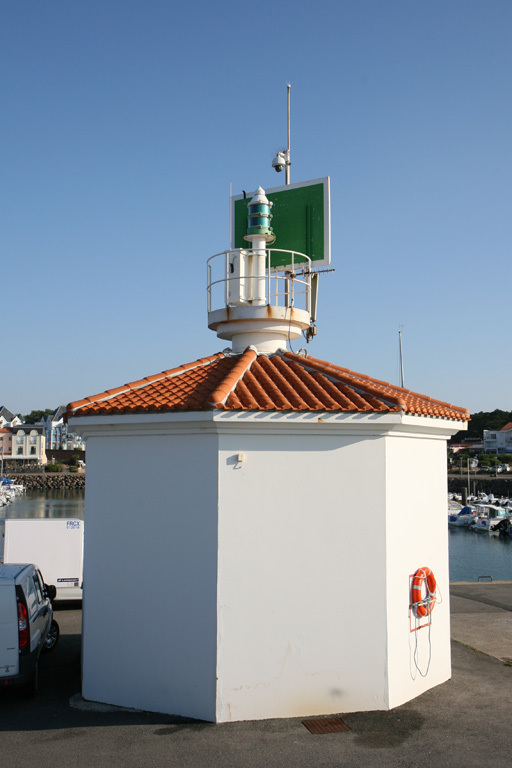 Located in a parking area in front of the port captain's office at the base of the west breakwater of Port Morin à l'Épine, the only port on the west coast of the Île de Noirmoutier, about 2 km (1.2 mi) west of L'Épine. Site open, tower closed. ARLHS FRA-635; Admiralty D1168; NGA 1104. 1829. Inactive since 1877. Approx. 28 m (92 ft) round stone tower with gallery; lantern removed. 1-story keeper's houses. This tower was capped but remained in place after its successor was built. Trabas has Andreas Köhler's distant view, a 2009 closeup is available, and French Wikipedia has a 1996 photo. In Guyomard and Carceller's photos the old tower is barely visible behind the newer one, but Huelse's historic postcard view and Google's satellite view show both towers. 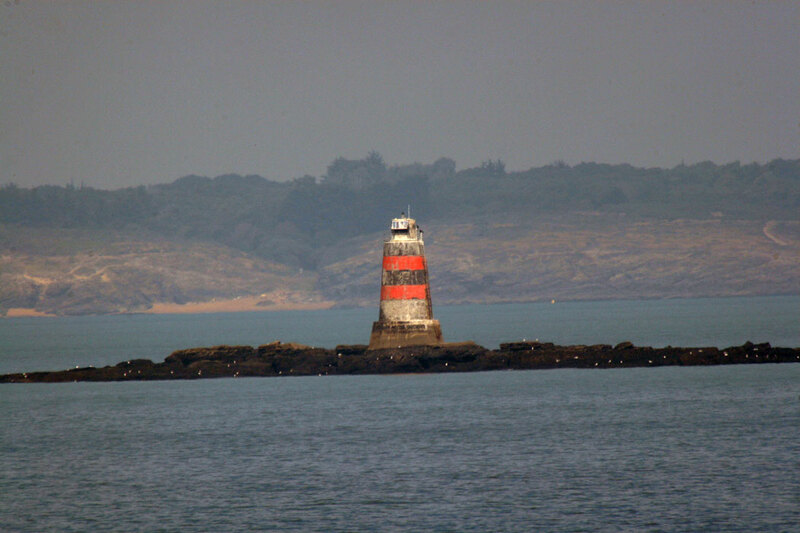 The Île du Pilier is a 4 ha (9 acre) islet about 3 km (2 mi) northwest of the Pointe de l'Herbaudière, the northwestern tip of the Île de Noirmoutier. The island is strategically located and has a long history as a monastic retreat, a pirate base, and a site of fortifications. It is now a coastal reserve and wildlife sanctuary. The light station buildings are the only structures on the island. ARLHS FRA-033. 1877 (station established 1829). Active; focal plane 33 m (108 ft); three white flashes every 20 s; also an auxilary light, quick-flashing red, at a focal plane of 11 m (36 ft). 34 m (112 ft) square brick tower with lantern and gallery, attached to 1-story keeper's houses. 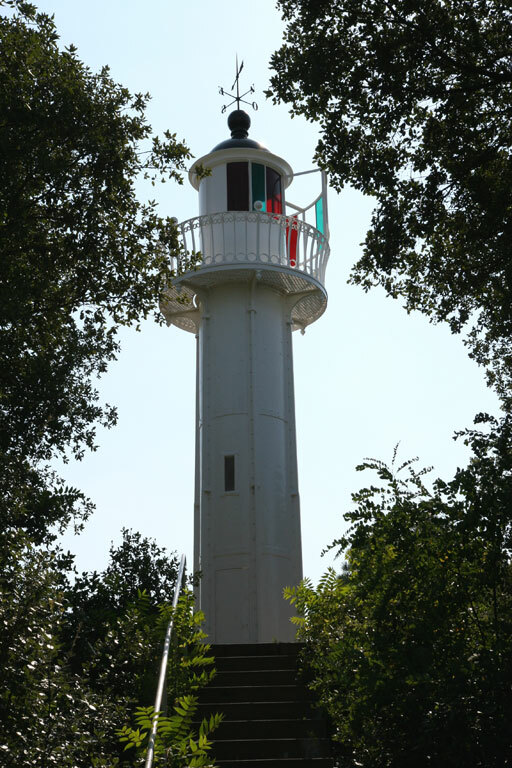 Lighthouse is unpainted brick with red trim; lantern and gallery painted red; the auxiliary light is shown from a red lantern set into the face of the tower (Fichou has a closeup photo of this lantern). A 2009 closeup is available, Trabas has Andreas Köhler's distant view, French Wikipedia has a 1996 photo, and Google has a satellite view. 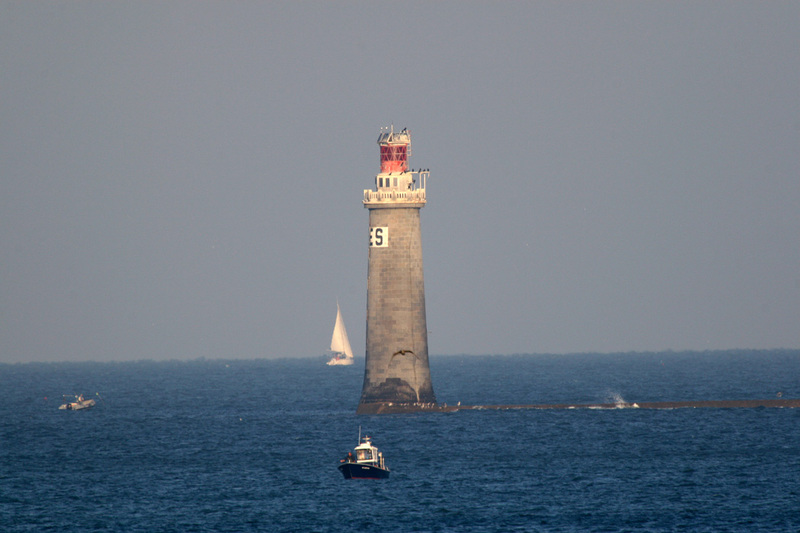 The lighthouse was built in five months in 1877, the fastest construction of any French lighthouse. Accessible only by boat. Site open (restricted during bird nesting season), tower closed. Site manager: Conservatoire du Littoral. ARLHS FRA-396; Admiralty D1152; NGA 0924. Date unknown. Active; focal plane 11 m (36 ft); quick-flashing light, white, red or green depending on direction. 16 m (52 ft) round stone tower, painted yellow with a black band at the top. Trabas has a photo and Google has a satellite view. 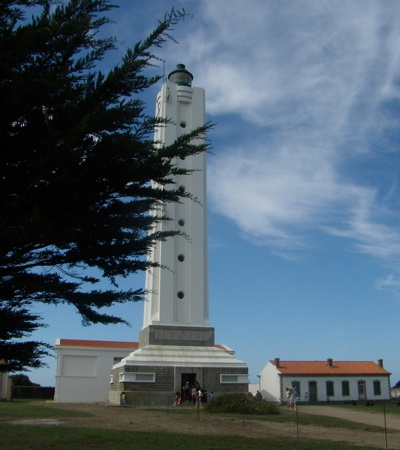 Located on a shoal about 2.5 km (1.5 mi) north of the northern tip of the Île de Noirmoutier. Accessible only by boat. Site open, tower closed. ARLHS FRA-546; Admiralty D1153; NGA 1092. Date unknown. Active; focal plane 14 m (46 ft); two white flashes every 6 s. 18 m (59 ft) round stone tower, painted with red and black horizontal bands. Trabas has a photo. 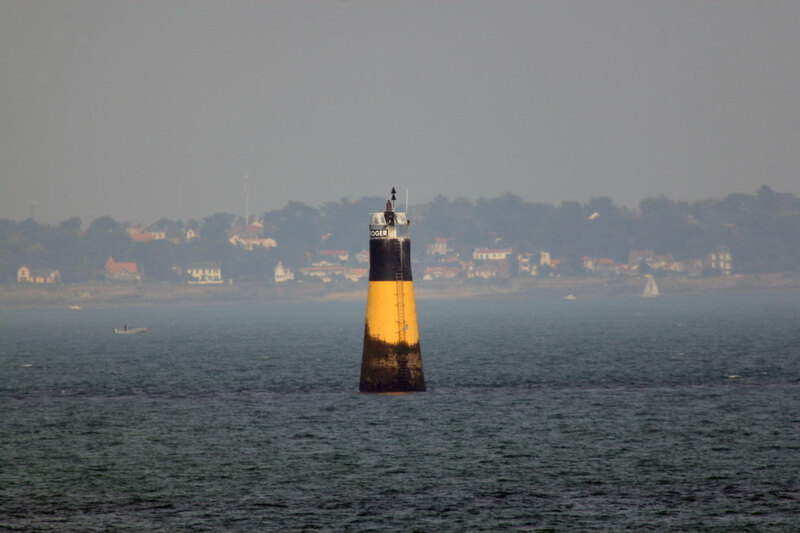 Located on a shoal about 6 km (4 mi) north of the Île de Noirmoutier. Accessible only by boat. Site open, tower closed. ARLHS FRA-736; Admiralty D1154; NGA 1088. 1867. Active; focal plane 34 m (112 ft); white, red, or green light depending on direction, occulting three times every 12 s. 19 m (62 ft) square cylindrical masonry tower with lantern and gallery, rising from the front of a 1-1/2 story keeper's house. The keeper's house is occupied by a resident keeper. Building painted all white, lantern black. A photo by Steve Grosbois is at right, Werning has a good photo, Trabas has a closeup, another closeup photo is available, Huelse has a historic postcard view, and Google has a satellite view. 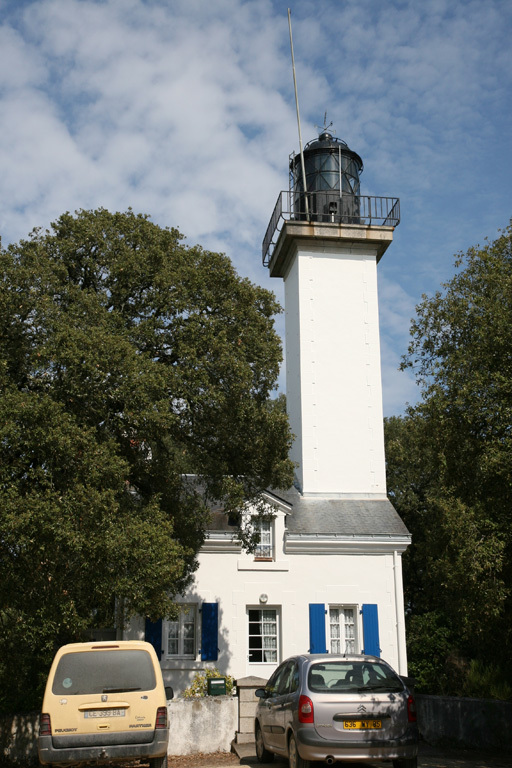 Located off the Allée du Tambourin on the northeastern corner of the island, about 2 km (1.2 mi) northeast of the Noirmoutier-en-l'Île waterfront. Site open, tower closed. ARLHS FRA-254; Admiralty D1162; NGA 1080. Date unknown. Active; focal plane 6 m (20 ft); red light occulting twice every 6 s. Light mounted on a short mast atop a hexagonal concrete equipment room. Trabas has a photo, and Bing has a satellite view. 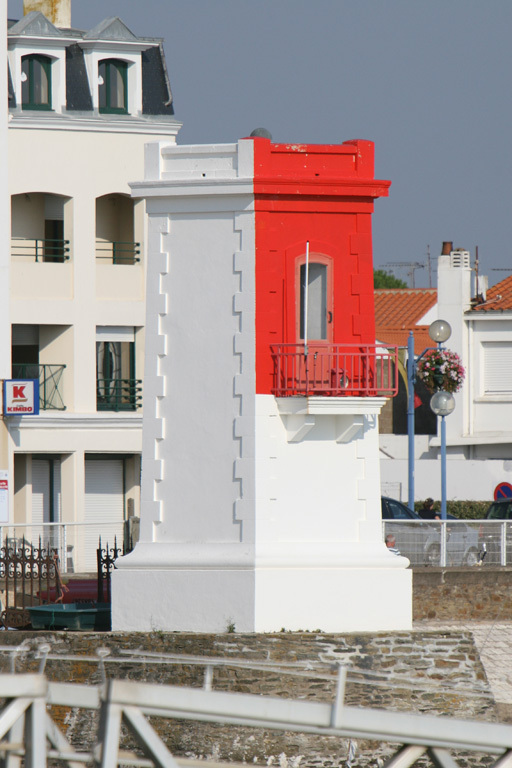 Located at the end of a 1 km (0.6 mi) long jetty protecting the harbor of Noirmoutier-en-l'Île. Accessible by walking the jetty. Site open, tower closed. ARLHS FRA-634; Admiralty D1164; NGA 1084. Note: The Baie de Bourgneuf is a broad sound sheltered from the Atlantic by the Île de Noirmoutier. 1888. Active; focal plane 6 m (20 ft); white, red, or green light depending on direction, 2 s on, 2 s off. 7 m (23 ft) square tower with a tile roof; the light is shown through a square window. 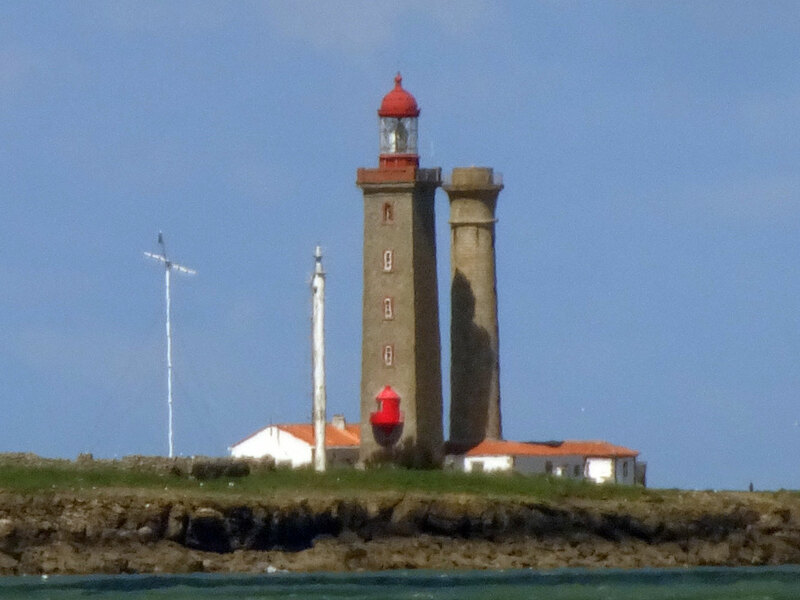 Lighthouse painted white with a triangular red daymark above the window. Werning has a photo, Trabas has a closeup photo, Guyomard and Carceller also have good photos, and Google has a street view and a satellite view. 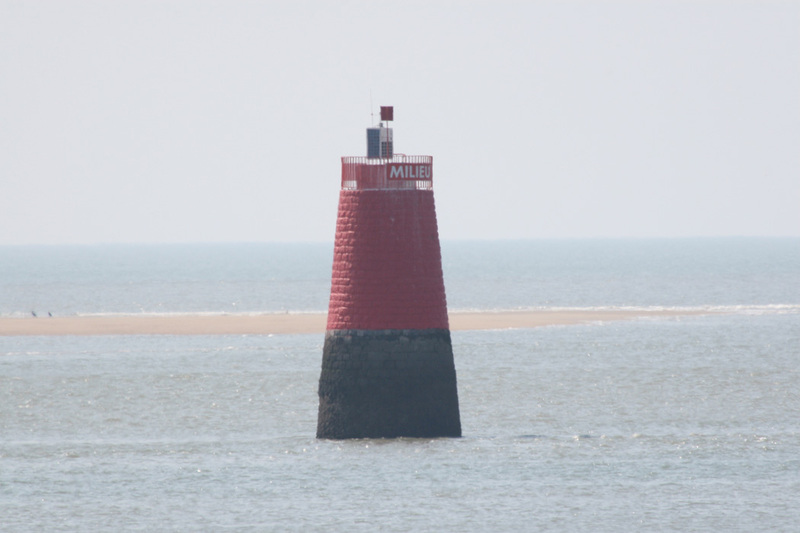 Located on the east side of the harbor entrance at L'Époids, about 3 km (2 mi) northwest of Beauvoir-sur-Mer. Site open, tower closed. ARLHS FRA-542; Admiralty D1161; NGA 1072. Date unknown. Active; focal plane 8 m (26 ft); white, red, or green light depending on direction, occulting three times every 12 s. 7 m (23 ft) semicircular masonry tower with gallery and an enclosed equipment room at the base, painted white. Werning has a photo, Trabas has a closeup photo, and Google has a street view and a satellite view. Brochets is a small oyster-fishing village on the southwestern shore of the Baie de Bourgneuf. Located about 3 km (2 mi) northwest of Bouin. Site open, tower closed. ARLHS FRA-541; Admiralty D1160; NGA 1068. Posted October 25, 2005. Checked and revised March 29, 2019. Lighthouses: 32. Site copyright 2019 Russ Rowlett and the University of North Carolina at Chapel Hill.